Hi guys! Hope each one of you is enjoying your travel. The spirit of exploration is something, that drives one to travel. And when it comes to travel, there's no place like India which has so many amazing places that it leaves everyone to ask for more. One of the most enchanting places of these is Nandi Hills in South India. Situated in Chikkaballapur district of the Karnataka state, Nandi Hills is also called Nandibetta or Nandidurg. Located at an average altitude of 1476 m(app. 5000 ft), this place has a historical value. Arkavathy river is believed to have originated from Nandi Hills. There are many versions about how the hills got their name. Earlier, these hills were called Ananda Giri or Hills of Happiness but it is believed that it was named after Yoga Nandeeshawara. Another story says that it was named Nandi because of it's resemblance with a sleeping bull(Nandi). Another version says it got it's name from the Nandidurga or fort built here by the erstwhile ruler of Mysore, Tipu Sultan. Nandi hills is a photogenic location. If you are a nature lover and appreciate the scenic beauty, this is the place for you. It boasts of some rare flora and beautiful, serene scenery. The cool breeze of the hills and the peaceful surroundings will fill you with renewed vigor. It's a paradise for nature lovers and a photographers' delight. You can get innumerable amazing spots, to click to your heart's content. 1. Tipu's Drop - It is a cliff at the top of the hills, where you can get the most comprehensive view of the hills and the scenic beauty around. It is situated 600 m above the elevated ground and is a must see for nature lovers. You will get a panoramic view of the city from here. This place, however, doesn't have a pleasant past. It is said that this place was used by Tipu Sultan to push his prisoners to their death. 2. Tipu Sultan's Fort - The fort on Nandi hills was started by Haider Ali but was complted by Tipu Sultan. The fort depicts the amazing art and architecture of that era and hence is also called Tashk-e-Jannat meaning Heaven's envy. It stands proudly on top of the hills. The arches numbering five and the minarates are a treat to watch. 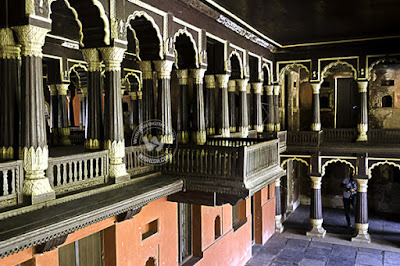 The construction in the fort is mainly of wood but the paintings engraved on walls and ceilings are a major attraction. Around the fort, you will find many trekking trails which pass through scenic surroundings. 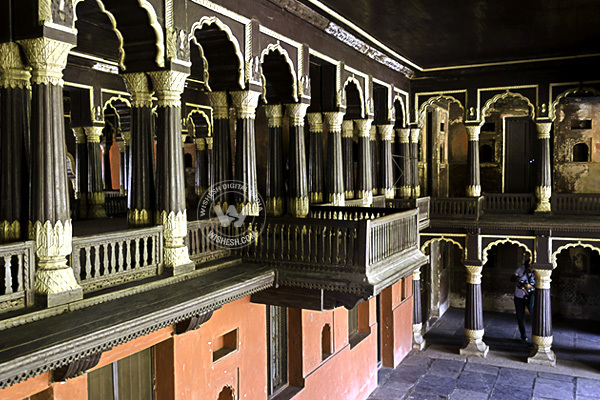 So trekkers have an added incentive to visit Tipu Sultan's fort. 3. 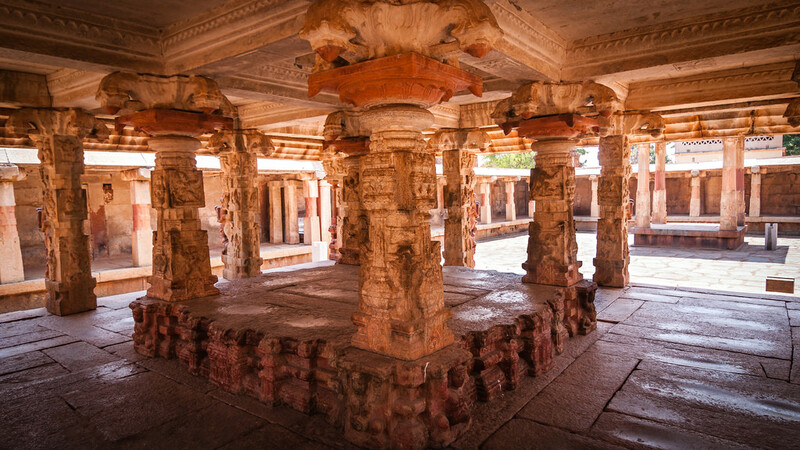 Bhoga Nandeeshwara Temple - Situated at the base of Nandi Hills, this is a 9th century temple with amazing architecture and design. The grandeur of the temple is actually mesmerizing. It is one of the oldest temples in Karnataka and is currently under Archaeological Survey of India(ASI). It is also one of the few temples which have been well preserved over the period of time. The intricate carvings and the design of the temple will simply take your breath away. It is difficult to imagine how the craftsmen of that time could build such structures without the aid of the modern tools. The temple is dedicated to Lord Shiva and has been declared a monument of national importance. It has intricately carved black stone pillars, which depict stories about Lord Shive, Goddess Parvati, Lord Vishnu, Goddess Lakshmi etc. Taking a stroll in the temple premises and admiring the beauty and architecture of the place is a perfect way of spending some quality time, for all age groups. 4. 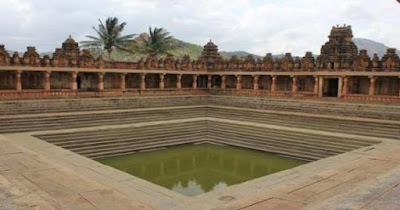 Yoga Nandeeshwara Temple - Situated at the top of Nandi hills, this is a twin of Bhoga Nandeeshwara temple. Karnataka has a history of building twin temples, one at the top and other at the bottom of a hill. A huge statue of Nandi, the bull, right at the entrance greets you and gives a glimpse of what to expect, once you are inside the temple.This temple is again dedicated to Lord Shiva and is yet another masterpiece of architecture. The main attraction in the temple are the monolothic stone pillars which are intricately sculpted with images of deities. It houses three temples dedicated to Arunachaleshwar, Uma Maheshwar and Yoga Nandeeshwar representing youth, marriage and renunciation of Lord Shiva. Two Dwarpalaks guard the entrance of the temple. 5. Amrita Sarovar - A beautiful water body formed by perennial springs, translates to "Lake of Nectar". It is also called Lake of Amrosia. It is the major source of water in the region. A visit to this place at night will leave you stunned when you see sparkling clear water in the moonlight. 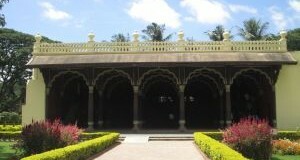 There is a chabutra near the Sarovar and it is said that Tipu Sultan used to come here to pray. 7. Paragliding - Nandi Hills is one of the few places in Karnataka where Paragliding is available. You can enjoy the sport in the midst of breathtaking scenery and peaceful surroundings to have a bird's eye view of the place. Air - The nearest airport is Hindustan Airport, which is 42 km(26 mi) from here. Mysore airport is 165 km (100 mi0 from here. From both these places you can either catch a train or go by road to reach Nandi Hills. Rail - Nearest railway station is Oddarahalli, which is 16 km(10 mi) away. Another nearby station is Dodballapur which is 17 km away. Chikkaballapur is 19 km(12 mi) away. All trains coming from Bangaluru stop here. 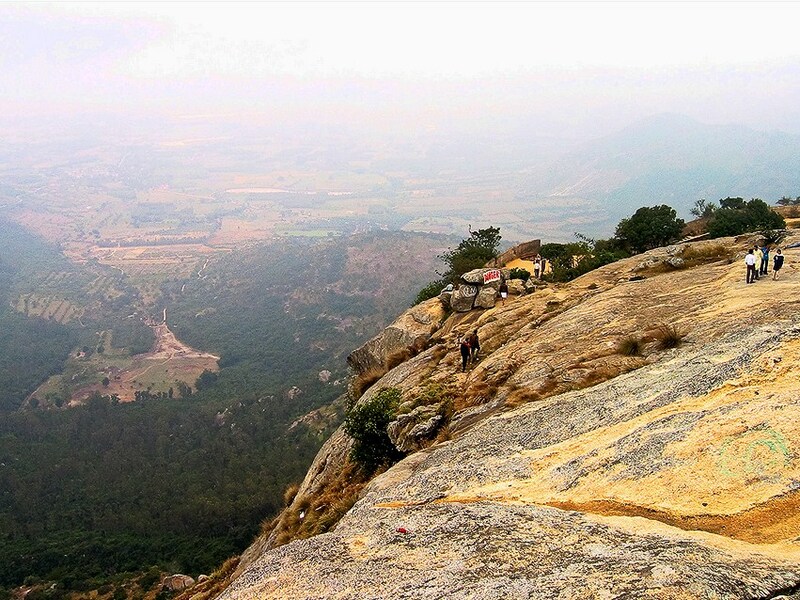 Road - Nandi Hills are just 60 km from Bangaluru, so you can drive or hire a taxi from there. State run buses are also available from Majestic bus station to Nandi Hills. Roads are good and drive is comfortable and pleasurable. 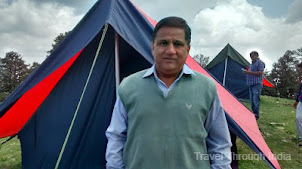 There are not many options for overnight stay in Nandi Hills as only one state run guest house is there. 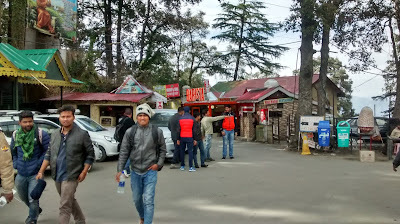 But there are hotels around the hills where you can plan to spend a night. 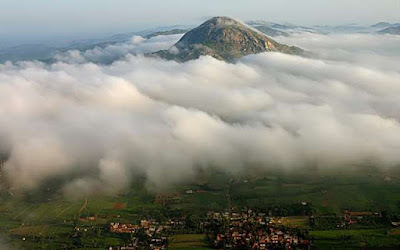 So if you are going to Bangaluru or Mysore, do not miss the charm of Nandi Hills. Enjoy the beautiful, pollution free, serene morning in fresh air.